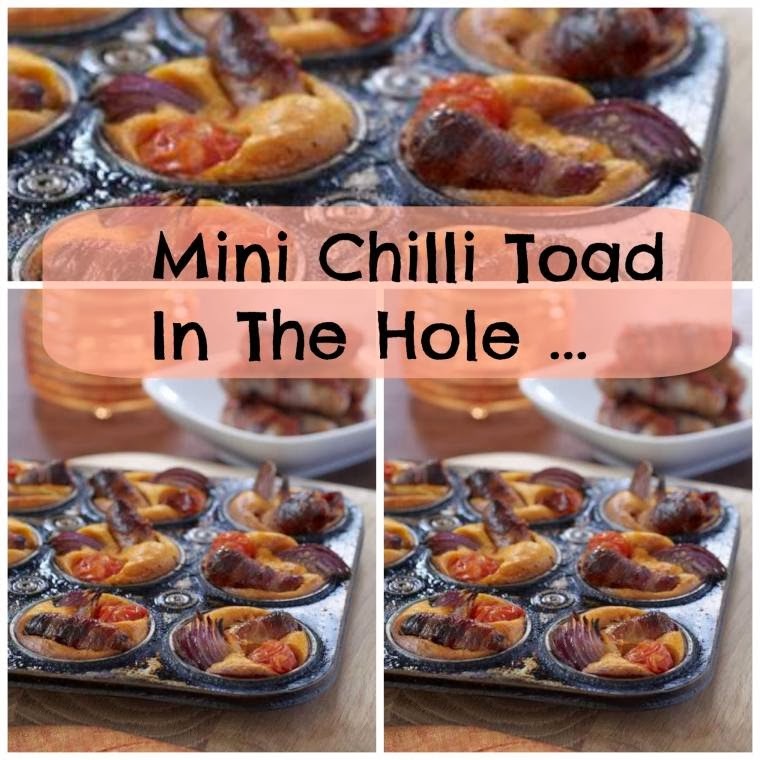 As a big toad in the hole fan, I just love this idea!! You will also need a 12-hole muffin tin. Sieve the flour into a bowl, then make a well in the centre, break the eggs into it and add some seasoning. Using a small whisk, whisk the eggs into the flour incorporating the flour around the edges as you do. Gradually add the milk and water and whisk until smooth. Add the chilli pesto and whisk again to combine. Set aside at room temperature whilst you cook the sausages – this is thought to improve the batter. Wrap the pancetta around the sausages and add to a small roasting tin. Drizzle over a little oil and toss to lightly coat. Cook on the middle shelf for about 15 minutes until the sausages are lightly browned and the pancetta has crisped up, then remove. Increase the heat to 220°C, 425°F, Gas Mark 7. Next, pour enough oil to just cover the base of the muffin tins and preheat for 3-4 minutes until searing hot. 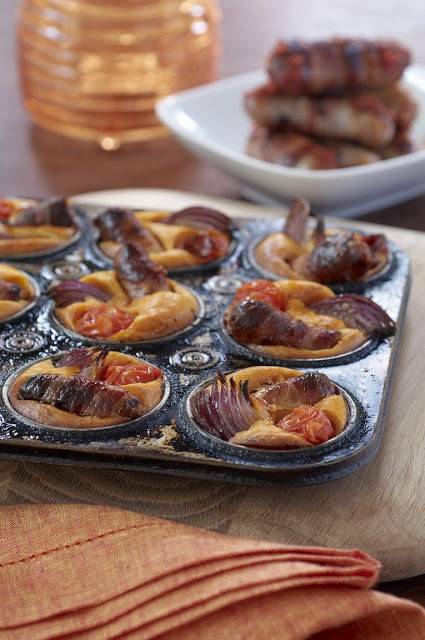 Arrange a sausage, a piece of red onion and a cherry tomato in each tin, and quickly pour the batter around them to three-quarters fill. Bake on the middle shelf of the oven for 20-22 minutes until slightly risen and golden – they will not rise much due to the addition of the sausages and vegetables. Loosen from the tins and serve straight away with extra pesto to taste. "Fiery Chilli Pesto Garlic Bread…"
"Who’s Keeping Look out? : Wordless Wednesday Linky …"
That's a funny name for a dish, this is the first time I've heard it. Anything with pancetta/bacon is always good and this is no exception. Looks like a great snack!